Why use robominers at all? Doesn't this still work? Doors pulse in the close direction for one tick every 10 seconds. It's working now and it is a thing of beauty. Thank you! Have fun and... keep you oxygen level safe! Efficient way to make Hydrogen? This is awesome @SamLogan. I would like to understand the piping you have shown here (I assume they are mechanical gas filters but I can't quite follow) and especially the paragraph below where you use vents to further increase the hydrogen imbalance. Do you send filtered output gas back into the chamber at the two empty spots? Would you mind including some pictures of that setup? Like this? Turn the off the shutoff valve just as the first 100mg gas packet gets to the valve and you will pass about 200mg of gas (divided into 9 tiles, or 22 mg per tile). You are excused The return line is optional, unless you have those gas lines somewhere you don't want chlorine when you disassemble them. I tried to combine the compact elegance of your original behemoth with some of the "easier to build" features of this post and settled on the Steam Mesomorph: It uses 800kg O2 (so four atmo suit stations), and 2800 kg of water. I was lazy and only put water and a single tepidizer in the center well. The water condensed in the other two wells but once the center turbines started, it all evaporated again. So much easier to split oil and gas two ways instead of 3! The hyrdo-sensor activated shutoff + needle valve (set to 0.1 g/s) combo works better than trying to get my stupid dupes to "hurry up and jam that block back in!" Come on Tytan, not even a please or thank you? The level of effort the OP put into this is clearly in evidence. It's ok Mathmanican, I'll take care of the rude paparazzi. The left turbine seems to work better with 600kg (3 trips) of water instead of 800kg. The oxygen has 4 more squares to go to on the left turbine and can't quite stand up to the steam pressure, at least in mine. Oh ... thanks by the way; I learned a lot from this post. Ooh I like that a lot. Can we see more of it? I love the shine bug solar farm. That's right I shamelessly stole your steam geyser setup too. Thanks for that gem. Imitation is the highest form of flattery. Wow that's pretty amazing @hpongledd. Inspiring. You guys should also check out @Nitroturtle's bases - beautiful and symmetric. It's not in the same league, but here is my 200-ish cycle base. Most of the stuff is @Neotuck and @Nativeland @mathmanican-inspired or just outright copied. Using rocket engine heating for any purpose? I love the beauty and symmetry of your builds. Nicely done. Little things that are not so little. Here is something that helped me with setting up the metal refinery to make hot petrol: I had to use automation because a moment of inattention causes broken pipes and sour gas everywhere with scalded dupes running around yelling obscenities, followed by me running around my computer yelling obscenities. The atmo sensor on the left is so I can (manually) control the flow of petrol into the refinery. The atmo sensor down in the pit is so I can (manually) relieve the clogged output pipe that happens when I overfill the refinery. I end up with a few kilos of petrol in the reservoir, and if I am lucky it doesn't overheat (but use steel if you have it). The only automatic part of the automation is the thermo sensor at the output; it sends oil out to the wells when the temperature is above 425C, otherwise it cycles it back through for another go. Pipes are insulated ceramic - but maybe just the output pipe needs this. I use the "iron ore to iron" recipe on the refinery because at this point I am struggling with getting enough refined metal to make 5 steam generators (4000 kg). It is twice as efficient as the rock masher thingy. Mesh tiles are under the refinery in case I need to break a connection and don't want to contaminate my hot oil or break the liquid lock. Notice the little blob of oil + petrol waiting for a top block to make the liquid lock. Worked like a dream! The OP used a small 4-tile room in the middle of a caustic biome almost fully evacuated to put chlorine into the wells, which is brilliant and much better than restricting the flow with a gas valve and shutoff . 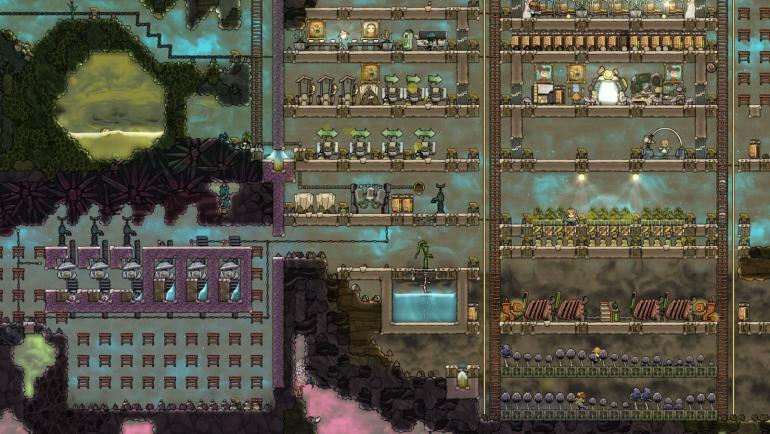 I had a problem where the game deleted my chlorine and replaced it with CO2 - twice! Again, I believe this is why god gave us the backspace key. I replaced it with 500mg of Chlorine per tile (cheating) and it has stayed there for the last few cycles. Might be Klei's attempt to squash this exploit (running QoL2 test branch now). Another thing worth mentioning is that the tepidizers have to be made of steel or you they overheat before they can finish the job of warming up the oxygen and steam generators to above 100C. And don't forget to make the refinery out of ceramic. I did ... more than once. Not good. Perhaps you already know how to trick a tepidizer. I didn't. Here is how you do it: Set the buffer and filter to 1s each and prepare to be annoyed. One thing I do differently from OP is to use high pressure vents to get 4.2 kg per tile of oxygen in the whole room. I think this is easier and cheaper in materials than using the canister method. It compresses down to 25 kg/tile in the top tiles once you fill it with steam. My new record is 156 cycles -- quite happy. I wasted a bunch of time with mushrooms and fish and sieving pw pools etc. It's just in time to prevent colony heat death. Notice I'm using @Neotuck's terrarium setup and have yet to lay down an electrolyzer or diffuser. I am starting to appreciate how important the gas sorter thingy is (like the one you started pretty early on the left) - without it it is hard to fill exosuits (without a way to reliably divert non-O2 gas), run an oil refinery or polymer press. I've been having a heck of a time making it though -- I need to find a way to reliably put less than 1.5 kilos of water on the vent, and often when I drip small amounts (30 g using the tile runoff method you showed me) the water gets displaced or just disappears. What is your secret? Oh ... and why the hydro sensor under the vent? First it's better to use oil instead of water, you can deal with more extreme tempatures without having to worry about boiling or freezing. Second you need one full tile under the vent. This prevents liquid deletion that sometimes happens when gas passes though the vent. Third the hydro sensor is just to give player control over the pumps, turning them on/off whenever you need them. You can also use atmosphere or thermal if you prefer.